Sorry, but this really bothers me. If any player for Our Washington Nationals is hurt--why are we waiting until the situation gets far worse than anyone expected? Or wants to see? Why do we wait until all is lost? The announcement late this afternoon that "The Most Thrilling Closer In The Game" is gone for the season is very disheartening. What made it worse is the rampant speculation from so called "experts" like Bob Carpenter on MASN claiming that Chad Cordero will be gone for a full two years. How does he know that? When he probably has zero contact with the situation. Our Washington Nationals have made no official announcement on the information coming out late this day. Sure, some reporters are told on background, but usually not the entire story. Well known Los Angeles Surgeon Lewis Slocum is reportedly in line to perform surgery for a torn labrum in Our Number 32's right shoulder. A meeting is set for Thursday in California. The same injury Ryan Zimmerman has on his left shoulder. Yet, Dr. Slocum has yet to see Chad Cordero on this latest of injury news fronts. So who really knows? Why is it that The Washington Post is reporting that "many" within the organization KNEW Chad Cordero was hurt all along, but didn't fess up to it? Even The Washington Times has chimed in. Well if someone high up in the organization KNEW--why was Our Number 32 NOT GIVEN a full checkup? Why was he sent to extended spring training knowing he may well be hurt? Sorry, but that makes no sense to me. Is not Our Players Health of 100% importance? I can live with the injuries. I can live with so many that you just shake your head in wonder over the calamity of it all. But what I can't live with is the consistent inability to find out what is wrong with Our Players--in a timely manner--before said player is gone for year, maybe more. If anyone in my family had an illness or injury--even a slightly sprained ankle--you can bet I would be making every single effort to find out the details, the prognosis, and the solutions to the end--for a healthy recovery. The African Queen would expect no less. 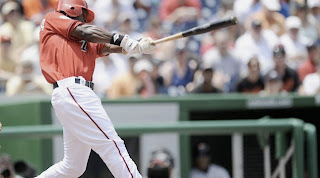 Yet, time after time after time--Our Washington Nationals consistently have an injured player announced as day to day, then week to week, eventually, some are out for the year. Cristian Guzman, Jose Guillen, Nick Johnson, John Patterson, Shawn Hill, Ryan Wagner, Dmitri Young, Brian Lawrence and Ryan Drese all come to mind. Now--it's Chad Cordero. Why do I have this feeling that Ryan Zimmerman is next? It just makes no sense. No it really doesn't. Hopefully, Chad Cordero will make a full and healthy recovery from whatever degree of torn labrum he may have. He is a pitcher. A tremendous amount of wear and tear is the norm. But, before all the speculation and rumor builds and the hype takes over--lets find out EXACTLY WHAT'S WRONG WITH "THE MOST THRILLING CLOSER IN THE GAME". And after those facts are figured out--lets find out what's going on in determining injuries to players for Our Washington Nationals. As Rickey Ricardo always told Lucy on the infamous "I LOVE LUCY!! Television Program of the 1950's--"There is some 'Splaining' to do." Yeah, there is. Like right now. This whole situation really, really bothers me. PS--This stunning late breaking news forced me to put off for another day The Baseball 101 For Women Story set to post this afternoon. Rest assured, that well needed feature is coming in the next day or two. At the same time, I could barely pay attention to Our Washington Nationals game tonight in Florida. Glad I really didn't after Big Jon Rauch gave it up BIG TIME in the 9th and 10th to lose the game. Andrew was hugging me so tightly--I thought my head was going to fall off. The African Queen was nearly on my back--her right fist pumped high into the air. Together, we were all jumping up and down like little children. Giddy over what we had all just witnessed. So much so--the concrete below us in Lincoln Suite #10 was swaying. Just like New Nationals Park at this very wonderful Sunday Afternoon moment. Was South Capitol Street EVER ROCKING!! What a feeling of GREAT JOY!! All thanks to Ronnie Belliard. In the most unexpected way. An amazing event had just transpired--something to always be remembered by anyone in attendance. Facing The Baltimore Orioles--Our Washington Nationals had battled to a deadlock, a 1-1 tie, until the decisive 12th Inning. During that frame--Baltimore had taken the lead in the top half--thanks to a two out, two strike clutch single by Adam Jones off Joel Hanrahan. An inning that Luis Ayala started, couldn't finish and Our Number 38 didn't stop. Thanks to Jones extending his left hand, his bat control hand--over the outside corner of the plate to sharply single to right--scoring Nick Markakis. A good At-Bat from a young hitter facing a young pitcher--still learning. The go ahead run that now found many--possibly half the remaining crowd--cheering and starting up the "Let's Go O's" Chant. They were loud. And this Baltimore Celebration continued--through Pete Orr striking out to lead off the bottom of the 12th. Paul LoDuca meekly grounding out to Aubrey Huff at third base for out number two. As every single Baltimore Fan stood--cheering their Closer George Sherrill--the very last bench player available to Our Manager Manny Acta stood swinging his bat in the On-Deck Circle. Dmitri Young was Our Last Hope. If Our Number 21 does not either hit a home run or reach base--THIS GAME IS OVER. And The Orioles win, not only this series but The Battle of The Beltways Series for 2008. At this point--Veteran Leadership took over. As stated yesterday--Our Washington Nationals have been decimated by injury. Quality players missed--forcing Our Number 14 to trust some of those that may not be ready--just yet. Yes, Elijah Dukes, Jesus Flores, Lastings Milledge and Kory Casto have all had their moments. But none of these youngsters have been consistent enough yet--to be always trusted late in any game. 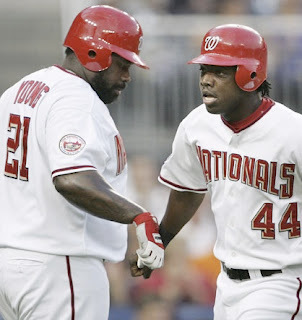 Dmitri Young has been there before. Manny Acta knows it. Big Number 21 stepped to the plate. And George Sherrill was afraid of him. Not wanting to give up the game tying blast--The Baltimore Closer was too cautious. Dmitri Young didn't give in to the pressure. Not getting himself out--Young walked on five pitches to set up an electrifying moment. Think about it. Up steps Ronnie Belliard--in his attempt to save the day. If Our Number 10 even gets a hit--the lumbering Meat Hook would be running before him. Seriously, you had to wonder whether this was a moment for Manny Acta to get creative. Pinch Run with a pitcher. If you get lucky enough to tie the game--send Tim Redding out there to play the outfield. No one else was left and Our Washington Nationals were trying to win. All hands on deck. Andrew and I actually had this serious discussion. Our Number 10 dug in. He of the whirlwind and hard swing. The "Let's Go O's" now reaching it's zenith around him. Never louder than after Belliard got quickly down 0-2 in the count. The seconds to come were crucial. The clapping for The Orioles was loud as Ronnie took a third pitch from Sherrill that nearly every single person in the ballpark thought was strike three. GAME OVER!! Everyone, except Home Plate Umpire Ron Kulpa. As Baltimore's many fans moaned and groaned in disgust--feeling the game was over, Andrew turned to me and stated: "How in the world can he take that pitch!!??" Having no idea, I just shrugged my shoulders in amazement. Fortunately, more surprise was heading our way--like in about 10 seconds. Down to his last strike. Our Washington Nationals down to their last out. Baltimore Fans down to their last opportunity to put it in Our Fans Faces--The Orioles Closer decided to get fancy. An off speed pitch--that hung out over the middle of the plate. Being a veteran, being a leader and being downright aggressive at the plate--Ronnie Belliard witnessed a beach ball coming his way. Exactly what he wanted to see. That man has confidence. The experience to make things happen. Did "The Ballplayer" ever deliver. Manny Ramirez, Jr. (as I have always lovingly called him) swung away fiercely at Sherrill's hanging breaking pitch AND DROVE IT--DEEP DOWN THE LEFTFIELD LINE. As every single head in the park turned in unison--everyone realized it was not a matter of whether this TORCHED BASEBALL had the distance. What everyone really wanted to know was whether this hooking baseball would stay fair. Third Base Umpire Dale Scott had the final say. But before Scott made the call. Before he had the chance to signal fair--many fans on hand already knew the outcome. Especially those perfectly positioned in Section 106--just inside the Foul Pole. New Nationals Park ERUPTED in a CELEBRATION NEVER REALLY SEEN THERE BEFORE. Ronnie Belliard had HAMMERED OUT AN UNBELIEVABLE GAME WINNING HOME RUN!! As Scott twirled his right hand for HOME RUN! !--The Baltimore Orioles Fans threw back their heads in disgust. 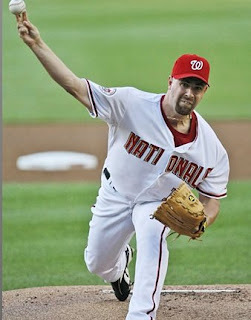 George Sherrill threw down his glove in anger--while Our Washington Nationals Fans threw up their Arms IN GREAT JOY!! Our Washington Nationals throwing themselves out of The Home Dugout and on to the field to greet Our Number 10 at Home Plate. Really this was an INDESCRIBABLE FEELING. Not since Ryan Zimmerman's walkoff homerun against Chien Ming Wang on Father's Day 2006 against The New York Yankees--have I ever felt this way. There was no way Our Washington Nationals were going to win that Sunday June Day in 2006. And there was no way Our Washington Nationals were going to win this Sunday June Day in 2008. Yet, they had--in miraculous style. Ronnie Belliard being greeted at Home Plate was the final culmination of a party he began not 30 seconds earlier. Never in the short history of New Nationals Park have I seen so many smiling faces of Washington Fans. And to win it--when left for dead--over The Baltimore Orioles made this game winning Home Run so much sweeter!! Andrew, Sohna and myself were just going CRAZY!! Crazy I tell you!! There is nothing like winning in grand style. Nothing like coming from behind in your last At-Bat. And nothing like winning when you are down to your last strike. No--nothing like THE GREAT JOY I FEEL THIS DAY. It's these unexpected times that bring The African Queen and I out to each and every home game of Our Washington Nationals. Never do we want to miss out. Never could we live with ourselves for not being able to rejoice--in person--over A GREAT VICTORY!! And sharing it with Our Friends. The Bang!! Zoom!! Of The FIREWORKS!! from this Sunday Afternoon will be remembered for some time. Curly "W" Number 33 proved that VETERAN LEADERSHIP IS IMPORTANT. Youthful exuberance can many times get you out--while an experienced man can take you to victory--GLORIOUSLY!! Final Score after one of Grandest Moments you can ever witness in person--Our Washington Nationals 3 and The Baltimore Orioles 2. Ladies and Gentlemen--This Is Why Baseball Is The Greatest Game--proved again this Sunday afternoon. Not long after Ronnie Belliard clubbed out his Game Winner--The African Queen and I ran into Our General Manager Jim Bowden and Our Assistant GM & VP of Baseball Operations Mike Rizzo in The Club Level Elevator Lobby. As JimBo fist bumps with Sohna--he states: "How did you like that win!!? Where pretty good at getting clutch results of late." Whereupon, Jim Bowden named off a series of players for Our Washington Nationals who have come up big--to win ball games in walk off fashion. Concluding with: "Ronnie's walkoff might have been the best style and strut I have seen in a long time." I have to agree--especially when Ronnie Belliard spit out a couple of sunflower seeds from his mouth--a split second after he slugged his game winning homer. A few seconds before Our Number 10 did the victory dance around the bases. If you are a fan of Our Washington Nationals and Baseball--there's not a whole lot to not like about that. Not in long time--have I left New Nationals Park so enthralled over the experience. Sohna agrees and stated so to JimBo: "I love that Ronnie Belliard!!" --she exclaimed. Jason Bergmann pitched a fabulous seven innings. His sole mistake to the slugging Luke Scott. The Baltimore Leftfielder took Our Number 57 deep and over the right centerfield wall in the top of the 7th--with two outs and two strikes. Scott's 4th Home Run off Washington pitching in six games played. As has been the case of late--when one of Our Starters pitches well--Our Offense shuts down. Bergmann left today's game in a 1-1 tie, his ERA moving ever so closer to 4.00. Pretty Good for a guy approaching 12.00 after his recall from AAA Columbus. Jason Bergmann showing the confidence and ability many think he's capable of producing. A fine effort--unjustly rewarded with a no decision. Speaking of an offense not producing consistently--Our Washington Nationals hit into four rally killing double plays this afternoon. And Our Manager ran through most of his bench players early in the late stages of this game. Which makes you wonder whether Manny Acta should sometimes use one of his pitchers as a Pinch Runner. Why waste a hitter, even if it's FLop--when that bench player might come in handy later. Felipe Lopez pinch ran and was eliminated on a double play. Our Number 2 was then quickly removed from the game by the next half inning. Waste of a role player--when any starting pitcher could have been just as effective. With Baltimore Starting Pitcher Jeremy Guthrie on second base after a one out double in the top of the fifth, Guthrie wandered a little too far off base after a pitch to his teammate Brian Roberts at the plate. Wil Nieves rocket fired a toss to "The Guz" which caught Jeremy by surprise for a gorgeous pickoff throw. Guthrie retired. But that was nothing compared to Kory Casto's effort in the bottom of the 4th. With Luke Scott on second with two out--Adam Jones RIPPED a grounder down the third base line. Casto reached and stretched all the way to his right to backhand the hard hit baseball. Then righted himself to make a one hop throw to Aaron Boone at first base for the Bang!! Bang!! Defensive Play Of The Game. Our Number 5 with a Vintage Ryan Zimmerman Moment. It was a very nice effort. Very, very nice. Roger Bernadina made his Major League Debut today for Our Washington Nationals. Called up from AA Harrisburg--Our New Number 7 was immediately given a start in centerfield and proceeded to single to right in his very first At-Bat. Baltimore Second Baseman Brian Roberts collecting the baseball and throwing it into Washington's Dugout as a Keepsake. Bernadina even scored Our Washington Nationals first and only run--until Belliard's Homer--on an Aaron Boone double play ground out in the first. Also, Bernadina showed some depth in center--tracking down a couple of deep fly balls--including one by Kevin Millar in the 9th, but also bunted poorly in the 8th--forcing FLop out at second. Looking to stretch out his bullpen, Manny Acta attempted to put Luis Ayala out on the mound for three consecutive innings. But, Baltimore got to him in the 12th on Markakis and Huff singles--setting up the go ahead score when Hanrahan came in and could not close out the inning. The decision was wise--the execution on the field--failed. 39,824 was the announced crowd at New Nationals Park this afternoon. Again, for the second consecutive day, the new largest crowd in the young ballparks history. Whether you want to believe it or not--Baltimore and Washington as rivals is good for baseball and the geographic area. One of these days--these two teams are going to be competing for more than just pride. On that day--the yearly get togethers will ramp up this sibling rivalry to a new level. Something Ronnie Belliard attempted to remind many of today. Just think--how greater this win would be--if First Place or The World Series was on the line? Pretty Special. Teddy--rejoicing in his Grudge Match Victory over The Oriole Bird--sat out The GEICO Presidents Race today. Driving around on a lawn tractor--Our Lovable Loser did not participate in the middle of the fourth inning scheduled event. Abe again came from behind to win easily. Interestingly, Our Washington Nationals are going out of their way to remind everyone that TEDDY won an UNSANCTIONED RACE last night and therefore has still never won a Live Race at RFK Stadium or New Nationals Park. As Sohna and I walked into the Centerfield Gate at New Nationals Park, we ran into our friend Eddie Cunningham taking pictures with Teddy. Having not seen him all season long--The African Queen went up to say hello. Eddie immediately stopped what he was doing and gave Sohna a hug. All three of us chatted for some time. Happy we were--to see him. Then, Teddy stopped by to celebrate as we serenaded him with: "Let Teddy Win! !, Let Teddy Win!!" Teddy feeling the love. Finally--as mentioned at the top of this post--Sohna and I enjoyed the afternoon with Our Friends Lisa and Andrew, their family and friends in The Lincoln Suites of The Stars & Stripes Club. How fitting, thanks to Our Number 10's Walkoff, we were situated in Suite #10 at New Nationals Park. And how much better that Andrew had commissioned and has hanging in his suite--a special painting depicting Ryan Zimmerman's Walkoff Homer on Father's Day--2006. A beautiful edition of 110 showing the celebration at home plate at RFK Stadium against The Yankees. Not moments after Belliard's Home Run--Andrew was considering a Ronnie piece. He tells Sohna and I a Zimmerman Opening Night at Nationals Park piece is already in the works. Chrissy cracked us up when see purchased one of those "HULK" style big hands to drink beer from. "I got to have that," she stated after seeing some kids drinking soda from one. Also, how about Evan. He may well be an Orioles Fan, but you had to love his cap--in Baltimore Colors with "YH" on the front in script. "Yankee Hater" apparently the meaning. There is a website called yankeehater.com that sells these caps in all other Major League Team Colors. Great Idea. Good use of the feeling many baseball fans have toward New York. We love these pictures. And enjoyed the time watching Our Washington Nationals in a different venue. Remember for us, it's all about the fun, the friends and the experiences. PS--Why in the world at New Nationals Park AFTER THE GAME--all the MASN Television Monitors throughout the stadium are showing The ORIOLES POST GAME SHOW!!! Decrying the last second loss by Baltimore. Sorry but that is ABSURD!! Nats Extra should be shown each and every game--no matter what. Showing Baltimore's broadcast is a total slap in the face. I can't tell you how much that pissed me off!! But still not enough to take away the joys of victory. Who is making this STUPID DECISION? And that is what it is--A STUPID DECISION made by people that have no understanding how much it undermines Our Washington Nationals and OUR FANS!! Just ABSURD!! It really is!! New Nationals Park on display with 8 of 9 Opening Night Starters heading to the Disabled List at some point this season. Tonight Lastings Milledge added to the pain and suffering when he pulled his groin muscle chasing down a liner to left center off the bat of The Baltimore Orioles Alex Cintron in the 3rd inning. I could complain about the quality of Our Players all I want--but when Nick Johnson, Ryan Zimmerman, Austin Kearns, Chad Cordero, Shawn Hill and Milledge all are placed on the DL--Our Washington Nationals are a far worse team. Sometimes not competitive, like this evening before the largest crowd to ever attend the new South Capitol Street Ballpark. 39,479 posted up to watch The Curly "W" Boys take on The "O's". Unfortunately, this game got out of hand early--thanks to some poor communication defensively by Our Washington Nationals, followed by worse pitching by John Lannan (having just a bad night) and "The Human Rain Delay" who just made sure things got out of hand. I could complain about Dmitri's Defense. I could complain about Lannan missing a comebacker to the mound. I could complain about Young and Lannan not calling for a simple infield blooper in the key third inning that fell for a crucial hit. I could complain about how Lastings Milledge played the hit ball in which he was eventually injured. I could complain about a Jesus Flores passed ball. I could complain about Luke Scott and Ramon Hernandez hammering Our Number 31 for some well stroked Home Runs. And I could complain about how Our Washington Nationals lost all forward steam once Our Number 44 went down. But, what good would it do? You can't blame players or management for injuries--no matter how good or bad you believe those lost starters to be. Someone, most likely Our General Manager Jim Bowden, believed they were Our Best choices. Obviously, from the way Our Washington Nationals are competing right now--there is some truth to it. You can't win without your best--even a team that during pre-season a .500 record would have been considered respectable. You know it, I know it--at times, Our Washington Nationals are hard to watch--such as this evening when The Orioles crushed Our Team 9-1. No way around it--this game was over early. Washington was not coming back into it. There is no use speculating over What if Nick This? Or How about Ryan That? or Could "The Chief" Do? It doesn't matter. Our Washington Nationals have been dealt a bad deck of cards in 2008. A Full House of injured players in this Poker Match that has decimated Our Lineup. Six of a Kind is not possible in cards--but Our Washington Nationals have found a new way to bend the rules. It's sad really. Our Team deserves better. Our Fans deserve better. And New Nationals Park deserves far better for the amount of effort made to put that ballpark together by--The District of Columbia--under the tightest deadline ever projected for a stadium. Before some of you set off on a tangent. I remind you--many thought Our 2008 Lineup had a lot of potential. Quality talent now lost to the Disabled List. Of course--I am not talking about Wily Mo or FLop--they are unique cases all their own. But clearly--the injuries have decimated Our Lineup. Our Washington Nationals are hurting. And as difficult as they may be to watch at times--The African Queen and I are not giving up. No, we are not. You can complain about under performing players, roster moves, trades, or the inability to sign player such and such. But, you can't complain about hurt players. Key performers all lost for significant time this season for the team that calls The Nation's Capital it's home. No, you can't. That's just not right. Our Washington Nationals are a far better team with Nick Johnson, Ryan Zimmerman, Austin Kearns, Chad Cordero, Shawn Hill and now Lastings Milledge all healthy. No question about it. None of those losses are anybody's fault. But it doesn't make watching games like tonight at New Nationals Park any more enjoyable. We miss all those guys. Because--it was never meant to be like this. Final Score from Humid, Hot, then Rain Delayed Cool and Comfortable New Nationals Park--The Baltimore Orioles 9 and Our Washington Nationals 1. To many fans great credit--the 39,479 who showed up tonight on South Capitol Street proved that people like baseball and it doesn't matter whether your team is in first place or not. As summer commences, schools are out and many folks turn to baseball for their outdoor enjoyment. This was one terrific crowd--reportedly a larger one coming for the Sunday Finale. But, The African Queen and I could do without the usual drunken bozos. Mostly Baltimore Fans in this case, who feel it's necessary to be vulgar and shout profanities the more The Orioles built their lead. Like Phillie Fans who have no class--it would nice if Baltimore's Fans would show a little more respect. Sohna and I never berate other team's fans. In fact, we usually engage them in friendly spirited fun. Unfortunately this evening--those fans from Baltimore sitting around us were classless. We did not appreciate their antics. During the game, Milledge was placed on the 15 Day Disabled list and AA Centerfielder Roger Bernadina was called up from Harrisburg. That roster move was not all. Additionally, Our Washington Nationals announced Collin Balester will be added to The Major League Roster for Tuesday Night's game at Florida. The 22 Year Old Pitcher is a top prospect and has been lights out over his past 10 starts at AAA Columbus. With not much more to say about tonight's game--the off field antics were quite entertaining. During the One Hour and Three Minute Rain Delay--most everyone on Club Level retreated to the friendly confines of The Stars & Stripes Club. As the crowd built--My Best Friend!! Screech!! showed up to ham it up, sign autographs and hand out a few Kids Baseball Gloves to a few children. But his best effort of the evening was racing some of the Suite Ushers on the second level. This was funny. Believe it or not--SCREECH!! Won The Race!! Finally--Tonight was The Grudge Match. The much anticipated Baltimore Oriole Bird versus Teddy in a NON-Sanctioned Middle of The Fourth Inning Race. This challenge by Teddy the result of The Bird tripping up Our Lovable Loser last night at New Nationals Park during The GIECO Presidents Race. This evening, virtually the entire crowd was on their feet waiting for this moment to come. After The Bird & Teddy were introduced--The Oriole Mascot took off--well in front of Our Number 26. But, then Teddy TURNED ON THE HEAT. Running at a pace never seen before--The Rushmore who has never won a Live Presidents Race--streaked across the outfield warning track--toward the right field corner--then pushed on by MIGHTY CHEERS--Teddy handily WON THE PRESIDENTS RACE for the first time IN HISTORY!! Teddy dropping to his knees in JOY!! This was a victory never before witnessed at RFK STADIUM or New Nationals Park. The standing ovation for Teddy said it all. But not moments later, it was announced by some organization called The Presidents Racing Association of America--they had not sanctioned this race. So, technically--Teddy DID NOT WIN!! Still, it was a GREAT MOMENT. I can't tell you how happy I was to NOT SEE The Baltimore Oriole Bird WIN!! We couldn't possibly go that low. Trouble was brewing. The Baltimore Orioles had runners on 1st and 2nd with nobody out. Our Washington Nationals were up 4-2 in the 9th. And Our Closer allowing those baserunners was not "The Most Thrilling Closer In The Game." The heat was on, both in the air and on the field and Big Jon Rauch was feeling the pressure as thick as the oxygen he was breathing. You really had to wonder whether "The Wookie" was going to produce his very first save since May 3rd at New Nationals Park. Was he ever in a hole. Everyone knew it. Not one single game played since that early May date on South Capitol Street has resulted in a save for any one of Our Relievers. Not even a back to back set of wins by Washington. The past three victories at New Nationals Park have all been in Our Team's last At-Bats. Those statistics alone depict the rough stretch Our Washington Nationals have played over nearly the past two months. With The Orioles now threatening, the many Baltimore Fans in this HUGE CROWD of 35,830 were letting Rauch know--they were appreciating his cardiac moment. And as hard as it may seem to believe, Chad Cordero was nowhere in sight. This game was Big Jon Rauch's to win or lose. This large throng was rising to the occasion. Those on hand were getting loud. The always pesky Brian Roberts was standing on second after a leadoff double (you got to like that guy--Roberts is simply a good ballplayer). The equally talented and young Nick Markakis on first after a full count walk. The sounds of "Let's Go O's" was being heard around New Nationals Park. The counter calls of "Let's Go Nats" were drowing it out. This game was getting personal--for the fans. And Our Washington Nationals needed to save the day. At the same time, Randy St.Claire needed to run out to the mound to save Our Number 51 from embarrassment. This game was on the line. Our Nats couldn't blow it against them O's!! Knowing the go ahead run was stepping to the plate in Melvin Mora. Knowing one more Oriole Baserunner could drastically change this game--Mr. St.Claire was not trading punches with "The Wookie". Brief, but to the point, Our Number 46 discussed the situation at hand. Catcher Jesus Flores, by his side--listening. When the one sided conversation ended--Randy St.Claire trotted back to the dugout. Discussion over--time to record some outs. Up stepped Mora, a quality player that gives his all each and every game. A competitor that also only wants to win. Looking in for the sign from Flores, Rauch slowly nodded his head in agreement on what to throw. Melvin Mora can be aggressive. He can swing at pitches in haste. In this case, Mora didn't realize, Big Jon WAS NOT going to throw him a fastball. Looking for a pitch to drive, Melvin swung at Rauch's first offering. A toss Their Number 6 thought was the heater. A toss Our Number 51 knew was a slider. With his momentum too far in front of the pitch--Mora swung on and sharply grounded to "The Guz" in the hole. Moving deftly, Cristian Guzman cleanly fielded the sharply hit ball, sidearms the baseball to FLop at second. Whereupon Felipe Lopez catches the pass while moving across second to retire Markakis and then FIRES the ball to Aaron Boone for THE TWIN KILLING!! Double Play!! Melvin Mora throwing his Batting Helmet down in disgust. Our Fans now on their feet--throwing up their hands up in GREAT JOY!! "The Wookie" pumping his fist in appreciation of his teammate's efforts. Washington Fans now standing--knowing this swift turnaround was a game changer. The Baltimore Fans exasperated over how quickly momentum had been lost. Just when you thought Our Washington Nationals were on the brink of blowing a lead--late--they had came up BIG!! The sounds of joy echoing throughout New Nationals Park were actually relief. Solace that Washington may well still win this ball game. But, it was not over yet. Because Kevin Millar was up next for Baltimore. A veteran hitter, maybe on the downside of his career--but still no easy out. As Millar stepped up to the plate, Big Jon Rauch stepped to the mound and stared him down. Focused and ready for action--Our Number 51 had the look of determination on his face. Rauch was now looking to close this one out. The noise continued to climb within New Nationals Park. Washington Fans now overriding the previous enthusiasm of Baltimore's contingent. Battling, Millar was not getting good swings off Rauch's slider and fastball. As this crucial At-Bat reached a 2-2 count--Big Jon went for the close out pitch. The Baltimore First Baseman, attempting to stay alive with two strikes, was swinging at anything close. As the entire crowd stood in anticipation--Our Number 51 tossed in over the plate an off speed pitch. A slider that Kevin Millar swung and POPPED UP--to centerfield. Big Jon Rauch NEVER LOOKED UP at the flight of the baseball. He knew this game was won. Slowly, confidently, Rauch walked off the mound to shake hands with Jesus Flores before Lastings Milledge even caught the baseball for the final out of this game. Facing the real possibility of blowing the lead and this game, The Bang!! Zoom!! of The Fireworks!! signaled "The Wookie" had saved the day while surviving the heat, both on the field and in the air. His 16th Save of 2008 was a "cardiac moment" now forgotten. Curly "W" Number 32 giving Washington their first back to back wins since May 3rd and 4th and sending the home faithful away happy--knowing The Baltimore Orioles at not prevailed at Packed New Nationals Park. Final Score from a steamy and humid Nation's Capital--Our Washington Nationals 4 and The Baltimore Orioles 2. Returning from the disabled list--Odalis Perez was on a pitch count of 80--that only got him through four innings. Despite walking three and giving up three hits, he really didn't look good, but he also didn't give up a single run. And you had to enjoy his double down the right field line off Daniel Cabrera in the third. A chopper just past the diving Millar at first base. What made Odalis' hit so good was his perfect slide into second base. A pop up slide not seen by ANY of Our Pitchers in recent memory. You had to get a kick out of that. Washington got the scoring started early, like three batters into the home half of this game. "The Guz" laced a double to right center to lead off the bottom of the first. Lastings Milledge then stroked a clean single up the middle, that would easily score Cristian Guzman. Then, The Orioles Centerfielder Adam Jones made the situation worse, when he charged in to scoop up Milledge's hit--only to see the ball roll under his glove and well past him. As the baseball began to roll to the centerfield wall--Our Number 44 was on his horse--eventually standing on third--thanks to a two base error by Jones. A mistake that proved costly for Baltimore--when Jesus Flores followed with a clean single to right for a early 2-0 Washington Lead. That advantage held up until the 5th & 6th innings when Outfield Inexperience cost Washington Badly. Roberts would lead off the top of the 5th and stroked a looper down the right field line off Steven Shell. Elijah Dukes ran hard for the ball--as he always does--but really could not reach it. But instead of letting the ball land and playing it in front of him--Our Number 34 attempted the sliding catch. BIG MISTAKE. Missing badly, the baseball scooted all the way into the rightfield corner. The swift Brian Roberts standing on third with a triple. A base he scored The Orioles first run from when Markakis grounded out to Willie Harris at second base. Baltimore's second run came in the 6th--under similar circumstances. Wily Mo Pena misplayed a single to left by Adam Jones. Jones advanced to second on the error and scored when The Orioles Brandon Fahey singled down the left field line in the very next At-Bat to tie this game at two. Two separate innings. Two separate mistakes had cost Washington badly. Thankfully, Our Washington Nationals fought back against The Orioles Daniel Cabrera in the bottom of the 7th. A leadoff walk by Willie Harris was followed by a pinch hitting assignment for Kory Casto. Batting for Joel Hanrahan--Casto stroked an opposite field looper down the left field line. The speedy Harris running hard--saw the play developing in front of him while rounding second. He wasn't going to stop--especially after Baltimore's leftfielder Jay Payton let the baseball get past him. Our Number 1 scoring easily with the go ahead run while Casto stood on second with an RBI Double. After a Cabrera Wild Pitch that sent Kory to third, Elijah Dukes followed with a clean single to center to score Washington 4th and final run of the evening. Youth was the difference in this game. Milledge, Dukes, Casto & Flores all played key roles. Lastings Milledge has 10 RBI in his last 18 games. This after knocking in only 21 in his first 58 games. Milledge would stroke two hits tonight. So did Dmitri Young. In the top of the 8th with Adam Jones on first base for Baltimore and two outs--Aubrey Huff was pinch hitting against Luis Ayala. Our Number 56 induces a routine ground ball to "The Guz" at shortstop. An easy flip to FLop at second was all that was necessary to retire The Orioles side. But, Felipe Lopez didn't run to second base to cover. A shocked Guzman looked over at Our Number 2--standing still--then tossed across the diamond to get the slow moving Huff. Totally uncalled for--thanks to Lopez not having his head in the game. Do The Orioles really want him--as rumored? Tonight's crowed of 35,830 was the largest since Opening Night on March 30th--despite a 13 minute rain delay at the start of tonight's scheduled 7:35PM Start. Take a look at this picture of the masses leaving the park tonight. A Good gathering. Who says people don't care about coming a baseball game--even when Our Team is not playing well? And even if Baltimore was the opponent. Rumor has it--Sunday's Final Game of The Battle of The Beltways in Nearly SOLD OUT. Finally, The President's Race had a twist. Teddy was winning all the way--only to be tripped up by The Baltimore Oriole Bird Mascot. A race changing moment that found Teddy getting up and fighting The Oriole Bird on the field. A melee that carried over into the tunnel down the right field. Fans were booing. Eventually, the two were separated, cooler heads prevailing. But during the next half inning--on the HDTV Scoreboard--was shown an impromptu Press Conference from New Nationals Park. Teddy and The Bird announcing a MATCH RACE--Saturday Night--during the 4th inning. A winner take all event that will be run instead of The GEICO PRESIDENTS RACE. The crowd actually cheered. Could Teddy possibly win for the very first time!!?? Middle of 4th--Saturday Night--at New Nationals Park. A Must See Event. After select Saturday Night Home Games ending before 10:45PM, Fans attending games at New Nationals Park are welcomed to remain and watch a baseball themed movie on the HDTV Scoreboard. Parking Lots will remain open. The Nats Express will continue running and concessions will be served on the 3rd base side of the ballpark. Fans can move to the lower bowl, if they wish, but my not choose Presidents Club or Diamond Club Seats. The first movie will be this Saturday Night after Our Washington Nationals play The Baltimore Orioles. 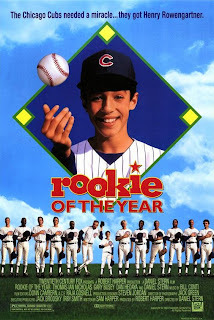 The movie to be shown: "Rookie Of The Year. A second scheduled Movie Night is set for July 12th. WHAT: The Washington Nationals will show baseball-themed movies on the Nationals Park HD-scoreboard following select Saturday night games. The first showing will be Saturday, June 28 approximately 15 minutes after the conclusion of the Nationals game vs. the Baltimore Orioles. Limited concessions will be available for purchase on the Third Base side of the ballpark. Fans may move to the lower seating bowl for the showing, excluding the Lexus Presidents and PNC Diamond Seats. The Nats Express will run throughout the movie; all Nationals Park lots will remain open until the movie’s completion and Metro is open until 2:00am based upon their weekend schedule. The movie will not be shown if Saturday’s game ends after 10:45pm. 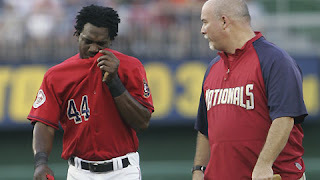 The Nationals face the Baltimore Orioles in their final 2008 interleague series Friday, June 27 through Sunday, June 29. Individual game tickets may be purchased by calling 888-632-NATS (6287) or via nationals.com. With David Beckham playing at RFK Stadium this coming Sunday for The Los Angeles Galaxy against DC United--Lot 8 will not be available for the free Nats Express Service to New Nationals Park. Lot 7 will be available--as has been the case previously when both teams play on the same date. Really, you should plan accordingly. Beckham is a huge draw--whether he and is team is playing well or not. Traffic could be rough--even if you drive to one of the paid lots near The South Capitol Street Ballpark. Here is the Official Press Release from Our Washington Nationals. D.C. United game at noon, RFK Stadium Lot 8 will not be available to Nationals fans. Nationals fans choosing to park for free at RFK Stadium may park in Lot 7 and take the Nats Express to Nationals Park may experience delays. Lot 7 may be accessed off the Whitney Young Bridge (East Capitol Street) or off of Oklahoma Avenue. The Nats Express begins ninety minutes prior to Nationals home games. Nationals Park is located a half block from the Navy Yard MetroRail Station on the system’s Green Line. Fans choosing to drive to the ballpark may purchase parking in advance at nationals.com, choose from one of three cash lots, Green Lot HH, Orange Lot W, or Orange Lot T; or use the Nationals Park valet service. Additional information on transportation and parking may be found at nationals.com/waytogo. When you've spent 10 Years in Professional Baseball feeling all the glory and all the pain life brings your way--you learn to be introspective, to the point and honest. All three, descriptions of Tim Redding. Our Number 17 has found a new home in Washington, DC. 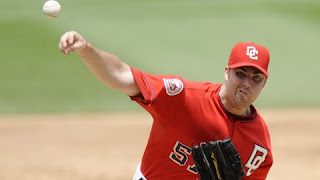 Signed off the scrap heap in early 2007 when Our Washington Nationals conducted an All-Comers Meet for their starting rotation--Tim Redding stuck in DC. Not originally with The Major League Club last season, but since his recall in Mid-2007, Redding has been one of Our Manager Manny Acta's most consistent performers. After 17 starts in 2008, Tim's appearances have resulted in 14 wins. Only six of which, he has received official credit. This past Tuesday, Tim Redding appeared with Charlie Slowes at ESPN Zone for Monthly Lunch Time Get Together with Fans. 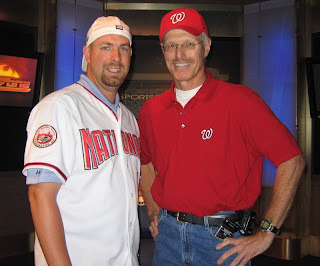 After this session was over, and all the autographs and pictures were signed and taken--Tim chatted with me about life, his career, and what's going on with Our Washington Nationals. This is an honest assessment you have to appreciate. With that, here we go with My Conversation With Tim Redding. When The Nationals came calling in early 2007, not many teams were looking at you as a possibility for their rotation. How far have you come since then? Three Strikeouts, one with the bases loaded, and a ground out with runners on 1st and 2nd with no outs had comprised the plate appearances by Jesus Flores throughout the entire evening thus far at New Nationals Park. Unproductive, was the only description for Our Number 3's first ever appearance for Our Washington Nationals in the Clean Up Role. Jesus Flores was batting 4th and he had failed all night--at least until the bottom of the 9th inning. With the score knotted up at 4 runs apiece, Scott Shields was on the mound for The Los Angeles Angels of Anaheim. The last time Shields took the field against Washington, was the very night many fans and reporters well reminder. Some would say the top highlight in the young history of Our Washington Nationals. 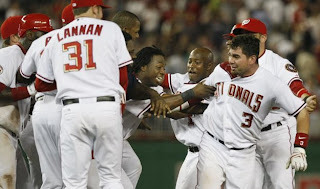 On June 14th, 2005, Washington was in the lead--first place in The National League East. D.C. was in a frenzy. Who could believe The Former Montreal Expos were possibly playoff contenders. If you followed baseball in this town, at all during that Inaugural Season--you remember exactly the excitement building in and around The Nation's Capital. There was no place like RFK Stadium. The Old Ballyard on East Capitol Street was fulfilling long lost baseball memories for generations young and old. On that infamous night, in Anaheim, Our Then Manager Frank Robinson and The Angels Manager Mike Scioscia got into a knockdown drag out verbal spat on the field near Disneyland. All over Jose Guillen telling Frank that Los Angeles Reliever Brendan Donnelly was using pine tar--a foreign substance to throw tricks with the baseball. Robinson got Donnelly tossed. Scioscia didn't like it--feeling Guillen had taken advantage of his former team--and teammates. In late 2004, Scioscia had kicked Jose off his team, for personal reasons--even with Los Angeles Serious World Series Contenders. The move cost The Angels in the playoffs. They were eliminated. There was some serious bad blood between these two. So much so, Jose Guillen called Mike Scioscia--"A Piece Of Garbage." --arguably the greatest quote in Washington Nationals History. Which brings us back to tonight. You see on that fateful June, 2005 summer evening--Our Former Number 6 stepped to the plate looking for revenge and launched The GAME WINNING HOME RUN against the very same Scott Shields--now standing on the mound at New Nationals Park. A game deciding hit three years ago that found Guillen fist pumping and pointing at The Angels Bench. What I will always remember as The Finest Home Run Swing EVER. PERFECT. (I still love reliving that moment). Now, Shields was again on the mound--with another game on the line. This time with Jesus Flores at the plate. Elijah Dukes standing on second base with one out--thanks to a leadoff single and advancement on a Lastings Milledge infield grounder to third. Our Number 3 had not looked good to this point. All three of his strikeouts thanks to his inability to hit the curve. His groundout, a result of getting himself in a hole. Not showing patience--Jesus was getting himself out. Once again, Jesus Flores was being taught a lesson in the school of hard knocks. How to hit, when it counts--in The Big Leagues. Knowing Flores was struggling--Shields started him off with, you guessed it, a curveball. Just as throughout his previous at-bats, Jesus swung and missed. Not even close. Not many remaining in the crowd truly believed Our Starting Catcher was going to succeed. But then, Scott Shields did the inexplicable--he threw two straight fastballs--both off the plate. A surprise considering the efficient manner in which The Angels had retired Our Number 3 all night long. Why change what's working? Now behind in the count and not trusting his fastball--Shields figured Flores would be looking for another heater as well. But what Scott Shields, The Angels and most everyone watching among the 29,180 didn't realize is that this Venezuelan Native is fast becoming a legitimate Big League Ballplayer and Threat. He doesn't forget. He's learning. Just two weeks ago, Flores had got himself out on a bad swing in a similar crucial situation. He had been schooled that night as well. Unbeknownst to everyone on South Capitol Street tonight, Jesus was about to teach a lesson of his own. Scott Shields was about to fail a test, against Washington, again. Figuring Jesus expected the fastball--Scott Shields tossed in another curve--a sure swing and miss if past was prologue. Only to see Jesus sit back on the pitch--EXPECTING THE PITCH--and HAMMER THIS PITCH into the right centerfield gap. Jesus Flores was EXPECTING A CURVE!! An off speed pitch while ahead in the count. The drive easily deep enough to score Dukes from second base with the game winning run. GAME OVER!! JUST LIKE THAT!! The winning knock setting off a wild celebration on the diamond by Our Washington Nationals and Our Fans in the stands. While the Bang!! Zoom!! of The Fireworks!! flashed and echoed across the night sky--A Graduation Ceremony was being held on the field below. Jesus Flores--still young, now more experienced and one-time, not wanted by The New York Mets--was receiving his first diploma. 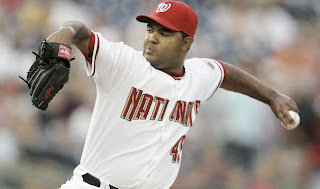 Not even wanted on The Major League Roster by Our Washington Nationals Management at the start of 2008 (The Team feeling he needed more schooling), Jesus Flores had pushed himself to the front of his class. He learned his lessons, waited for his chances. And when opportunity struck this evening he gave thanks to the patience Our Manager Manny Acta has shown him. The sight of Manny hugging Jesus on the first base line--the sign of a Teacher Proud Of His Pupil. Curly "W" Number 31 was a Term Test. A Final. A chance to show your knowledge. The occasion to move to the next grade level. The coming out of Our New Starting Catcher--for now and the future. Tonight's 5-4 Victory over The Los Angeles Angels of Anaheim was one fine moment in the development of A Core Player for Our Washington Nationals. Jesus Flores Graduated with Honors. A position he hopes to Master in. Tim Redding pitched a very nice game tonight. Again, he did not get the victory. Our Washington Nationals now 14-3 in his 17 starts, although Tim only has credits for six of those wins. Going six innings, walking just one--Our Number 17 was removed after just 84 pitches. Considering his comments yesterday at ESPN Zone--you had to wonder whether he was pushing Manny to allow him to go farther into this game. Especially after Luis Ayala blew the lead in the top of the 8th--allowing two runs. The same fate which happened to Jason Bergmann on Monday Night, with Saul Rivera the culprit. Knowing his bullpen is overworked--Our Number 14 made the right call in the top of the 8th. With Our Number 56 struggling again--two runners on and only one out--Manny Acta went for the near two inning save from Big Jon Rauch. Although "The Wookie" would surrender the game tying inherited runner to score on a sacrifice fly--Our Manager had no other choice. Our Bullpen is not doing the job. Rauch was rested and clearly has been Our Best Reliever. He may well have received a blown save, but he didn't let the game get out of reach. It was a gutsy move by Manny Acta and I applaud the effort. As it turned out, Jesus Flores gave Big Jon the victory--his fourth of 2008. Luis Ayala just looking lost--not confident. 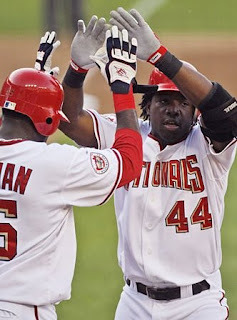 Lastings Milledge pounded out a line shot home run in the top of the first inning off The Angels Ervin Santana. A two run shot with "The Guz' aboard that might well have been the hardest hit baseball Our Number 44 has hit all season long. He hammered it! Washington would score their 3rd and 4th runs of the evening in the sixth when, with the bases loaded, Ronnie Belliard walked to force in Elijah Dukes and Wily Mo Pena singled to right off Santana. Of course they failed to continue the one out rally after Willie Harris popped out and pinch hitter Kory Casto struck out on three consecutive pitches to end the threat. A failure that would have been remembered had Washington not won, along with a bases loaded and NOBODY OUT situation in bottom of the 7th. A frame Washington didn't score again after Jesus Flores struck out, Dmtri Young popped out and Ronnie Bellliard grounded out. Until Ayala fell apart in the 8th--The Angels threatened only once, in the third. With the bases loaded and one run already in against Redding, Los Angeles Second Baseman Howie Kendrick flies out to Elijah Dukes in medium deep right field. Our Number 34 doesn't set himself to run in to catch the ball--to give him momentum for a toss to the plate. Angels Third Base Coach Dino Ebel takes notice. With Garret Anderson tagging at third--Ebel sends Anderson home. Elijah Dukes, catching the baseball standing still, simply rears back and heaves a one hopper just up the line--toward third base--right to the glove of Jesus Flores. This was Athletic Talent at its best. Garret Anderson called out easily to end the inning on a fly out, throw 'em out double play. Home Plate Umpire Mark Wegner so mesmerized over this Defensive Play of The Game--he had his right fist already up in the air to signal the out call--even before Flores had tagged The Angels Leftfielder out. Dukes received his just due from Our Fans--A Standing Ovation. What a throw!! To their credit, Our Washington Nationals ran both on and off the field tonight between innings. No one walked. Thank you. Teddy was leading The Presidents Race nearly the entire distance this evening--way out in front. Only to spot a penguin. Yes, a penguin standing near the stands down the right field line. Our Lovable Loser abandoned the race and headed off into the crowd. Abe ran from behind to win. And tonight, for the first time all season--The Running Tally of Wins by Abe, Tom, GW & Teddy (Mr. Zero) were shown on the right centerfield wall scoreboard--immediately after the race ended. A tradition Sohna and I enjoyed viewing at RFK, missing all year at New Nationals Park. Finally, for the last few innings of this game, The African Queen and I were invited to a Jefferson Level Suite by Our Former Section 320 Faithful Friends--Kathy & Dave. Their company was hosting a group of employees at the ballpark. We ran into each other between innings in The Stars & Stripes Club. Their boss willingly invited us in to enjoy some of their fun and experience tonight's game in a different atmosphere. We had a blast. This particular suite was DIRECTLY BEHIND HOME PLATE. Great view of the game.